The EMD SD40-2W is a Canadian-market version of the SD40-2 diesel-electric locomotive, built for the Canadian National Railway by the Diesel Division of General Motors of Canada Ltd. (formerly General Motors Diesel) of London, Ontario; 123 were constructed between May 1975 and December 1980. The major difference between the SD40-2W and a regular SD40-2 is the fitment of a wide-nose Canadian comfort cab, denoted by the 'W' in the model name. ^ trainweb.org. "EMD SD40-2 Order Numbers". The UNofficial EMD Home Page. http://www.trainweb.org/emdloco/sd40-2.htm. Retrieved on 2006-11-27. 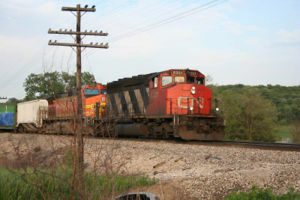 The Canadian National Railway Acquired 123 of the SD40-2W locomotives, numbered 5241-5363. The InterMountain Railway Co. N scale model is being manufactured with the 4-window safety cab, the snow shields over the air inlets, and the distinctive stairwells and handrails of the Canadian National version. The InterMountain Railway Co. N scale SD40-2W has been manufactured with the 4-window safety cab, the snow shields over the air inlets and the distinctive stairwells and handrails. The model features include: sharp painting and lettering, etched metal details and wire grab irons. All locomotives are factory equipped with ESU sound decoder or ESU non-sound decoder. DC only is available for N scale. Thise locomotives are painted orange/gray with green striping and black.orange lettering. The scheme/lettering appears to be inspired by the classic "Flying" Rio Grande". They are fully assembled with operating knuckle couplers. These locomotives are painted black w/ white frame stripe, red and white arc logos and lettering. They are lettered "CANDO Rail Services" with the companies web address below. They are fully assembled with operating knuckle couplers. These locomotives are painted black & white striped, red cab with yellow frame stripe and white lettering. The scheme is referred to as "Sergeant Stripes" for the angled stripes that adorn the hood. Most likely that is a modeler or railfan term not one coined by the CN. They are fully assembled with operating knuckle couplers. These locomotives are painted black w/white stripe, red cab & yellow frame stripe and white lettering. The scheme is referred to as "website" for the www.cn.ca under the CN logo on the side. They are fully assembled with operating knuckle couplers. These locomotives are painted black w\red nose & yellow frame stripe. The long hood is decorated with the colors & logo for the 1986 expo in Vancouver. The CN noodle logo is in red. They are fully assembled with operating knuckle couplers. These locomotives are painted black w/white angled stripe, red nose, yellow frame stripe and white lettering. The scheme is referred to as the "Map" for the gray North American map that is in the background of the CN logo. 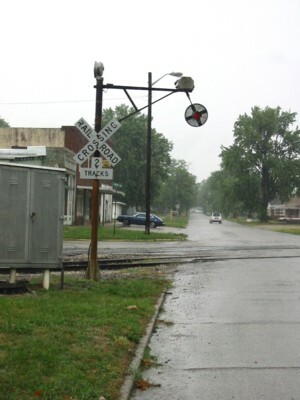 This scheme appeared around the time that a CN-BNSF merger was proposed with a possible merger name of North American Railway. They are fully assembled with operating knuckle couplers. These lease fleet locomotives are painted black & blue red with yellow frame stripe and white lettering. The scheme is inspired by the original CN "Sergeant's" scheme. The logo is white/black blue /red. They are fully assembled with operating knuckle couplers. This locomotive is now working for a new owner. The "Sergeant Stripes" are still there but the reporting marks have been changed to a sylized "NHRR". They are fully assembled with operating knuckle couplers. This locomotive is also working for a new owner. The "Map" is still there but California has disappeared along with the wet-noodle CN logo. The reporting marks have been changed to a sylized "NHRR". They are fully assembled with operating knuckle couplers.